Steve Evans could not hide his frustration with referee Dean Whitestone as his side narrowly lost out to promoted Doncaster Rovers. The Stags boss was pleased with his side’s efforts at the Keepmoat Stadium on a day when Rovers secured their place in League One next season. 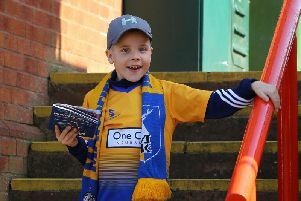 The defeat is a blow to Mansfield’s own hopes of reaching the play-offs as they slip to 13th in the table, four points from seventh-placed Carlisle. And Evans was disappointed with the man in the middle, Mr Whitestone, after he decided not to award Stags a penalty when Alfie Potter hit the floor. Evans said: “It was a good performance, but we’re disappointed the penalty was not given at the end. “We have seen penalties like that given and he was bang on there to see it. “We will continue to be frustrated by decisions, the referee was not good for both sides. “He has one big decision to take and he got it wrong. We have suffered. “We are running on nothing at the moment, but we came here fancying it. “We have come to a team who are a wonderful side and who are getting promoted. “Donny deserve to be promoted and they are a wonderful team. “We see the celebrations out there, it is special for Doncaster, they are a wonderful side and let them enjoy it. “We will go to Wycombe and look for the positive result. I’m not happy with the penalty decision we could have come here and drawn.